We are super excited to share that we made a number of sales last week at the F.A.D Market in Brooklyn, and have made donations to UNICEF to support their clean water and education projects! Clean Water: We were able to make a donation to support the purification of 20,000 liters of water (via 5,000 water purification tablets) for families in emergency situations where the water supply is compromised. This protects children and families from water-borne illnesses like cholera and typhoid. Education: We also made a donation to support the provision of 40 exercise books and 80 pencils to schoolchildren for continuing their schooling and practicing writing and arithmetic, helpful children to fulfill their full potential. Thank you to the 70 artists from 21 countries around the globe who made this possible! We are so grateful to you for your participation in the project and for your shared vision of a healthier and more just world! Instagram photo posted during Day 1 of the F.A.D. market. Tomorrow is the last day to catch the documentary about street photographer Garry Winogrand (“Garry Winogrand: All Things Are Photographable”) at the Film Forum in New York City! I saw the film today and recommend it to anyone interested in street photography. The documentary chronicles Winogrand’s ability to “find endless and various beauty in a messed-up world,” to quote the New York Times’ review of the film. The film showcases hundreds of photos he took in New York City where he was born, in Texas and finally in California, where he lived in the years leading up to his sudden death of cancer. Moving Walls Exhibition - Only Three Days Left! There are just a few days left to visit the 24th “Moving Walls” exhibition in NYC - I hope you find some time to check it out! It closes this Friday, July 20. Moving Walls is an annual documentary photography exhibition produced by the Open Society Foundations Documentary Photography Project and exhibited at the OSF offices. Since 1998, the "Moving Walls" exhibition series has showcased nearly 200 photographers in 24 group exhibitions that align with the Open Society Foundations’ mission to advance human rights and social justice. 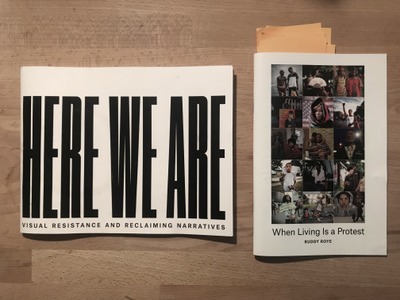 The current exhibition, “Here We Are: Visual Resistance and Reclaiming Narratives,” has been open free of charge to the public at the Open Society Foundations' New York office (224 West 57th Street at Broadway) since last October and will be closing this Friday. The nine artists, journalists, documentarians, and advocates in the exhibit “engage with art and documentary practice as forms of resistance within the context of race, religion, sexuality, political and economic repression, and colonial history.” They are: Xyza Cruz Bacani, Endia Beal, Rahima Gambo, Eric Gyamfi, Stephanie Mercedes, Reentry Think Tank, Ruddy Roye, Dread Scott and Daniella Zalcman. 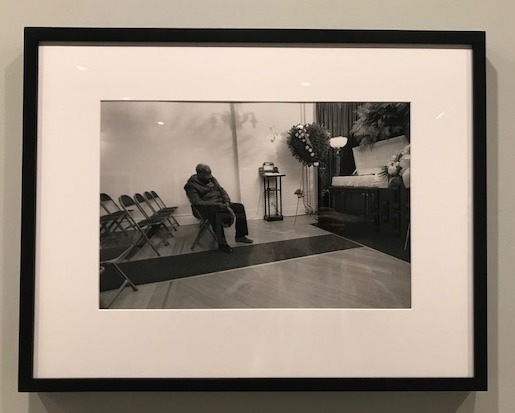 I have included photographs below from three of the bodies of work featured in the exhibition (more information in captions). 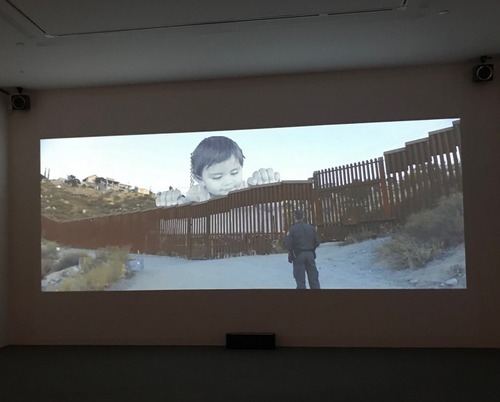 I hope you get a chance to check it out if you live in the New York City area - the exhibition is extremely moving and thought-provoking. “I AM, We the People” by Reentry Think Tank, which works to transform the stigma surrounding previously incarcerated individuals. Copies of two of the (free!) exhibition books. Here at Picture A Healthier World, we are constantly thinking of ways to improve the project so that it is as effective as possible in supporting our two-pronged mission to provide positive exposure for artists while supporting urgently needed health services around the world. Since our relaunch in January, we have received valuable feedback from a multitude of artists, shoppers, website visitors and other interested parties around ways that the project can be enhanced to better support our mission. Following these conversations, our site was briefly “under construction” so that we could take time to do the research we needed to offer you a more effective platform. We are introducing a reconfigured project of which the primary focus is the sale of greeting cards that promote the artist’s visibility. To that end, the back of each card features the artist’s name, website and social media information (ex. Instagram handle). That way, both the shopper and card recipient become potential patrons of the artist and can reach out directly to artists to inquire about their work. We still offer the option for artists to sell their cards in print format as well, and have changed the pricing structure so that artists are now compensated for print sales. After accounting for materials and labor costs, half (50%) of profits are donated, and the remaining amount is divided between the artist (35%) and PAHW (15%) . PAHW retains 15% of profits to cover operations and administration expenses, which include but are not limited to website development and management, website hosting and subscription fees, labor costs, customer relations and marketing to grown the project. We hope that this next iteration of the project helps us drive even more support towards global health and human rights initiatives! We look forward to hearing your continued feedback about the project. Please don’t hesitate to contact us directly. As always, thank you for your continued interest and support. "Cover Up" by ©Fidel Iranzo. Today is World Malaria Day (and the 70th anniversary of the World Health Organization!). When shoppers add an item to their shopping carts, they currently have the option to choose to support malaria prevention by providing malaria prevention pills to children in communities facing the deadly disease. (Please note: the health and human rights initiatives supported by Picture A Healthier World are subject to change based on changes in the projects led by the organizations we support). Visit the WHO’s website for a series of interviews with leaders involved in the malaria response - including Bill Gates - as they reflect on the fight against the disease that claims 445,000 lives each year. Also check out the statement by WHO Director-General Tedros Adhanom Ghebreyesus, detailing the critical need to ensure that no one is left behind in accessing life-saving services to prevent, diagnose and treat the disease. 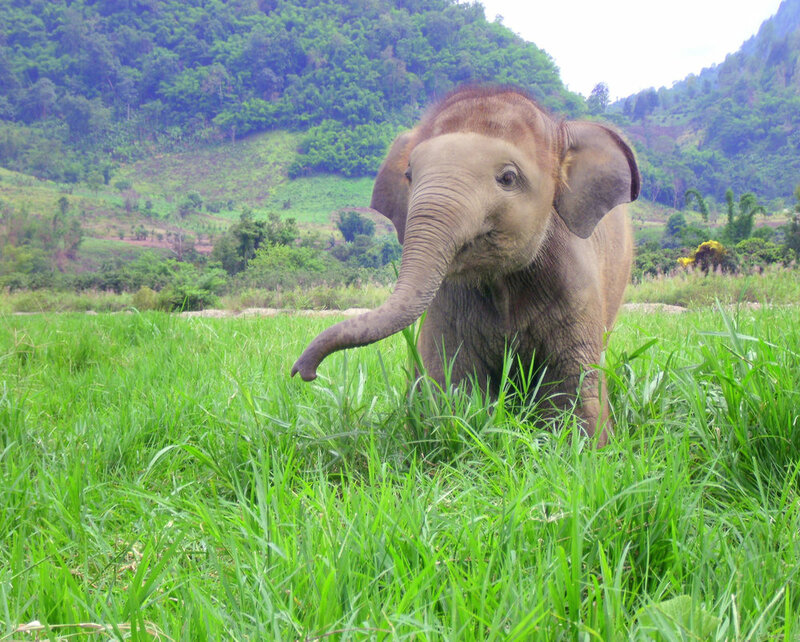 "Baby Elephant" by Rachel Bradley. Photo Location: Chiang Mai, Thailand. 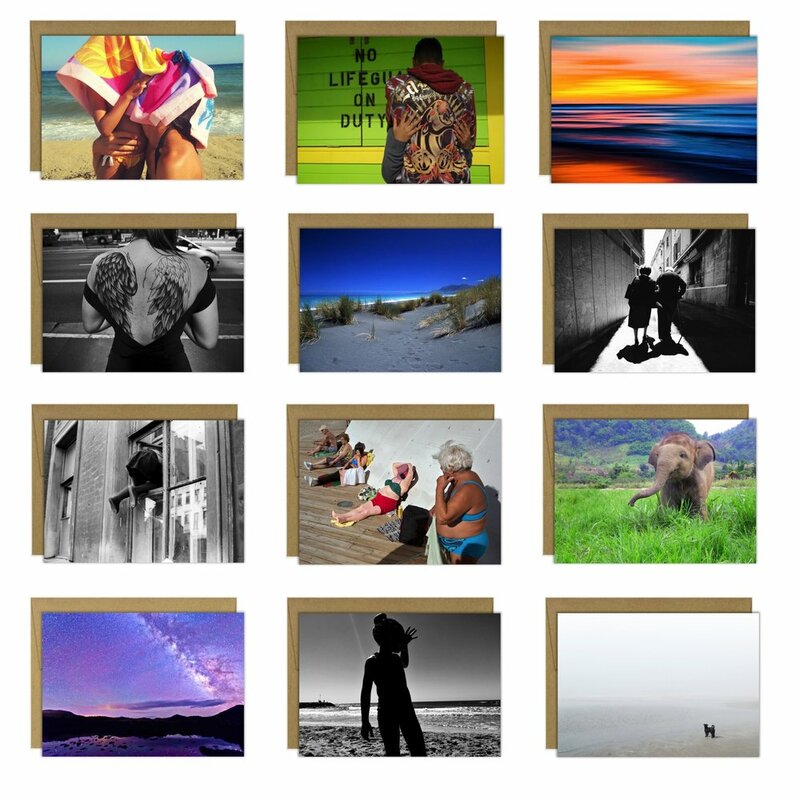 When shoppers purchase a photograph in our gallery, they currently have the option of supporting three health and human rights initiatives: malaria prevention, clean water and art therapy. (Please note: the health and human rights initiatives supported by Picture A Healthier World are subject to change based on changes in the projects led by the organizations we support).Al Jazeera’s recent video provides a nice overview of the status of the malaria crisis today, and what needs to be done to prevent the mosquito-borne disease from ravaging communities, mostly in sub-Saharan Africa where 90% of malaria deaths occur. About 3.2 billion people – almost half of the world’s population – are at risk of malaria. Malaria is caused by parasites that are transmitted to people through the bites of infected mosquitoes. Each year, there are over 200 million cases of malaria, and an estimated 429,000 deaths. Children under age five are particularly susceptible to infection, illness and death from malaria. Additionally, malaria infection during pregnancy is associated with low birth weight among newborn infants — one of the leading risk factors for infant mortality and sub-optimal growth and development. As a result, malaria has serious economic impacts in Africa, slowing economic development and perpetuating the cycle of poverty. Malaria is a disease of poverty, afflicting primarily those living in malaria-prone rural areas in poorly-constructed dwellings that offer inadequate barriers against mosquitoes. Yet malaria can be prevented by sleeping under insecticide-treated nets, residual spraying and administering anti-malarial drugs. As a result of these strategies, global malaria cases declined steadily between 2010 (237 million cases) and 2015 (211 million cases). However, according to The World Malaria Report 2017 published by the World Health Organization, progress in the fight against malaria has stalled because funding has plateaued. In 2016, the number of cases increased significantly to 216 million. By selecting "Malaria Prevention Pills" when you add an item on our site to your cart, up to 896 tablets of anti-malarial drugs will be administered to children in malaria-prone communities. Read more about how your purchase can support malaria prevention by visiting our FAQs page.